Please Note: The BPRO-316VF is no longer manufactured. Please refer to the HD-BL8 as a replacement. 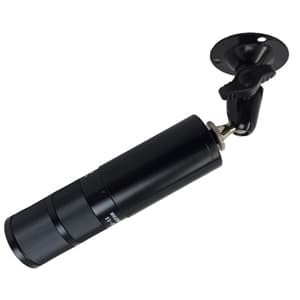 The BPRO-316VF is a varifocal bullet camera made for indoor and outdoor CCTV surveillance. The BPRO-316VF uses a Sony 1/3" 520k Super HAD CCD II sensor which supports 700 TV lines of resolution (also known as 960H resolution). This bullet cam has a 3.5-16mm varifocal lens which allows installers to adjust the angle of view from 3.5mm (wide angle of approximately 90 degrees) to more zoomed in angle at the 16mm setting. The BPRO-316VF is enclosed in a IP66 compliant weatherproof housing which allows it to be used indoors or outdoors. For outdoor surveillance applications where the camera is exposed to the sun, we recommend using the sun shield that is included. The shield is optional for indoor surveillance applications. The 3-axis concealed cable bracket allows this security camera to be ceiling or wall mounted. The cable through bracket design protects the video and power cable from being tampered with. The x8 Sense-up feature allows this camera to be used in low light applications. Please take a look at the sample surveillance images captured with the BPRO-316VF here and sample surveillance videos using the BPRO-316VF here. For ultra low light and zero light applications, CCTV Camera Pros recommends using an Infrared Camera. The following video demonstrates the color day time mode and the low light surveillance mode of the BPRO-316VF bullet camera. Sample videos with the camera lens set to the 3.5mm setting and the 16mm setting are shown. The following indoor images were captured in our office. This particular room is 16 feet wide by 21 feet deep. The camera is mounted under a shelf in the corner of the room. The shelf is eight feet high. The above image was captured inside our office with the florescent ceiling lights turned on and the camera lens adjusted to the 3.5mm setting (the widest view). The above image was also captured inside our office with the florescent ceiling lights turned on but this time with the camera lens adjusted to the 16mm setting (the most narrow / zoomed in setting). This surveillance image was captured with ceiling lights turned off and the office door half way open with the hallway lights on. We also left 3 PC monitors turned on in the room to create a low light / ambient light environment. This image was captured in the same environment as the low light surveillance image above it, except that the camera lens is zoomed in to the 16mm setting. The table that is in view is about 21 feet away from the camera at the farthest point. We also have a 1080p HD resolution bullet security camera available with a 3.5 to 16mm lens. You can use the HD-BL8 with our iDVR-PRO hybrid DVRs or connect the camera directly to a TV with this HD-TVI to HDMI converter.